This skin is suitable for any location and map – for survival, for the creation of new buildings, houses, or for an ordinary walk in the woods, in the sandy biome or along a beautiful river. 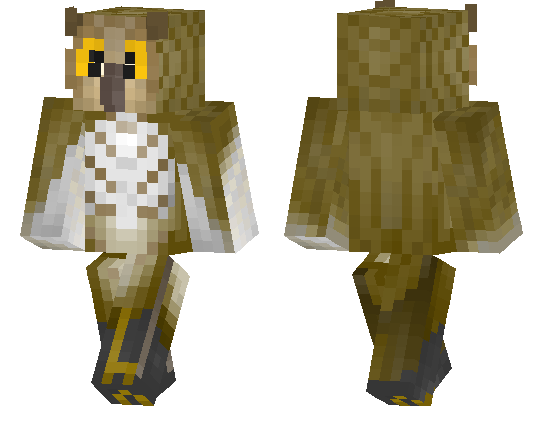 Skin Owls 1.2.10 is made at a high quality level and will allow you to change so many things in your world. On our site you can choose the appropriate modifications to add real birds to the game. And in their environment to be some time owl. What pleases, the skin is thought out to the smallest detail – you can be a wise owl or, on the contrary, inexperienced and very young. Much depends on the place where you stay. What does an owl skin look like? An owl looks just like a real one – a big head with round big eyes, a long convex nose, light feathers on the neck and darker ones all over the body. The bird looks very impressive – appearing in such an image anywhere in Minecraft Pocket Edition, it is easy to impress anyone. Therefore, do not think for a second, hurry to add the skin of Owl 1.2.10 to your game client MCPE and learn new worlds in the form of a wise bird. In addition, to experience this skin will be appropriate on your favorite multiplayer server. New resource packs, skins or sids make the cubic reality so special and unique. And to play the role of an owl – this is all for the first time. Therefore, do not miss the opportunity and add something non-standard to your gameplay.